MILDA represents a platform for a vocal regional defence of customary land, and an opposition to the corporate land grab agenda. The World Bank is being accused of putting the interests of foreign investors before those of local landowners in the Pacific. The Pacific Network on Globalisation (PANG) is just one of hundreds of organisations around the world calling for an end to the Bank's Doing Business rankings system. 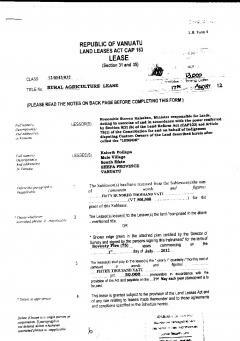 A total of 11 senior representatives of the people of Lelema (Lelepa and Mangaliliu) led by Chief Kalkot Mormor of Mangaliliu have all appealed to the Minister of Lands, Steven Kalsakau to “please revoke the Rural Agriculture Lease” that he signed for Leasee Kalorib Poilapa of Mele Village on August 17, 2012.